Sand, Wind and Stars - LRDG, 70 years on: With a little help from our friends. Fans of the Desert, and I mean real desert, living in the West are a small but very dedicated bunch. Always keen to help fellow travellers with snippets of information about shipping, waypoints, border crossings and that all important answer to the question, ‘How’s the going?’ Since launching this Blog and the main web site about our plans I am indebted to many and feel compelled to list them here. From Jonathan and Roseann Hanson in Arizona, USA: This sounds a great trip. Good luck from both of us here at ConserVentures and Overland Expo. From Lois Pryce in London. Ooh! That looks amazing. If you can cope with any more excitement after that it would be great to see you at our film festival in Devon Adventure Travel Film Festival. 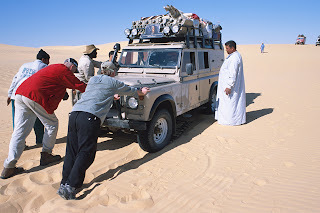 From Michelle Forrest in UK: ‘I was doing some research on the LRDG and came across your web site following a Google search for my Grandfather, Harry Harrison who I believed was in the group. The photo shows Mahmoud's Land Rover being pushed on our last Gilf Expedition in 2003. Mahmoud is behind the wheel, watched by Lootfi. Pushing are Kevin White and Rich Washington. It the hat is Issa - the coolest guy in the Desert. The pic is, in fact, a recreation of the Ice Cold in Alex scene isn't it? Ah - the lovely Sylvia Syms ....... did she have a twin sister..........?